The Roadmap onStandard Essential Patents for a European Digitalised Economy from the European Commission’s DG Internal Market, Industry, Entrepreneurship and SMEs (DG Growth) sets out how it believes increasing transparency on standard-essential patents and its other objectives with SEPs and FRAND licensing might be achieved. A study report commissioned by DG Growth in support of this initiative on Transparency, Predictability and Efficiency of SSO-based Standardization and SEP Licensing (the CRA report) proposes, among various other recommendations, that declared patents and patent applications should be centrally assessed by standard-setting organizations or by the European Patent Office to determine whether they are actually essential to standards including those developed by ETSI for 3G, 4G and 5G. This intervention is unwarranted and results would be unreliable. It would introduce various inaccuracies with significant subjectivity, biases and would be very costly in any attempt to do such a massive job thoroughly. Parties should be entitled to use, internally and in bilateral or multilateral agreement and in litigation with others, whatever patent-evaluation techniques they wish. That is entirely different to a particular “patent-counting” methodology and assessor being imposed. DG Growth also headlined in its Roadmap that it would like to make SEP values and FRAND royalties clearer to prospective implementers. If it prescribes the creation of a centralized SEP assessment database, as described above, this inevitably will also lead to it being used to determine a patent owner’s share of SEPs and FRAND royalties. This is problematic due to the inaccuracies described and it would also troublingly lead to the setting of prices on a company-by-company basis, which is not and should not be the role of the European Commission or instruments it controls. Justice Birss concludes in Unwired Planet vs. Huawei that “in assessing a FRAND rate counting patents is inevitable”. The parties in the case did indeed use that among other valuation methods, but their respective patent counts differed very widely – for example, by a factor of five for the total number of LTE SEPs. However, the judicial process enables the court to figure out where the biases and inaccuracies lie in case-specific circumstances and make sense of differences in opinion. Intervention with centralised essentiality assessments would be a blunt instrument that would be subject to political and other adverse influences. The regime would lack the flexibility to adapt that exists in the marketplace among companies acting independently and that occurs among parties in litigation with due process in the courts. The implicit assumption that objective and accurate determinations of portfolio essentiality, patent strength and value can be made with extensive assessments of numerous patents, or with in-depth evaluations of relatively small samples of these, is deeply flawed. Evaluating standard-essentiality is a fact-intensive, complex and highly subjective task, as is assessing patent validity and patent value. Only a court of law can make definitive determinations on these issues. The opinions of others tend to differ widely, as illustrated when comparing the results of third party “patent counting” studies in which assessors evaluate companies’ shares of SEPs. I first analysed this using linear regression and measuring correlation between the results of two studies in an article I published in 2011. It showed the results of the two studies from around then were totally unrelated. Expanding my analysis to include many more publicly available studies since then also reveals very wide disparities. For instance, LG’s share of LTE patents judged essential by various assessors range from 2.9 percent to 23 percent – a factor of eight. 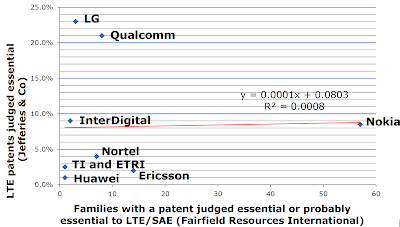 Huawei’s share of judged-essential LTE patents range from 0.6 percent to 10 percent – a factor of seventeen. Nokia’s share of judged-essential LTE patents range from 2.3 percent to 54 percent – a factor of 23. Portfolio-wide assessments are necessarily shallow due to the large number of patents and work required per patent. They are therefore inherently imprecise. There is no precision or certainty in determinations absent the impossibility of in-depth patent-by-patent court determinations for entire portfolios of thousands of patent families. Conducting in-depth assessments on relatively small samples of patents does not fix this shortcoming. The proportion of SEPs in portfolios cannot be projected from random samples of patents with the precision of predicting the results of coin tossing. Patent selections (e.g. those applicable to devices rather than networks, or which patents in a patent family) and essentiality determinations are with significant personal judgement, bias and uncertainty. Consensus is that patent values are highly skewed. Many patents are worth little or worthless because they would likely be found invalid or not infringed by a court. As shown in Commonwealth Scientific and Industrial Research Organisation v. Cisco, with one patent licensing at around one dollar per unit in comparison to very little for most WiFi patents, some patents are worth hundreds of times more than the average SEP in a standard. This is all probabilistic. In other words, determining overall essentiality across thousands of patent families and among many patent owners with standards such as 4G LTE is so subjective and potentially unreliable that any assessor’s count of the number of SEPs owned by a given company is questionable. The corresponding patent strength or patent value that might be subsequently derived, in absolute terms or in relation to other patent owners, is even more contestable. Authorities should only make assessments and publish figures that are reliable and can be measured reproducibly – such as “weights and measures” and in official statistics such as demographic figures and the national accounts– which SEP counts are not. Patent attributes should be assessed as they currently are in the marketplace as the market and its participants see fit, with owners’ disclosures and various third-party assessors of SEPs. Parties should also be able to consider other factors and make different assessments based on, for example, their own technical analysis of declared patents. Market forces can determine and change which standard-essential technology factors and assessments suit the market best, while bureaucracies struggle to get it right and can be very resistant to needed change. Where disputes arise, the courts can make determinations with due consideration of industry practices. Implementers of SEP-based technologies have the legitimate concern that it can be difficult to determine exactly which patents they are infringing, from whom they must seek licenses and how much in FRAND royalties they should pay. In response, ETSI’s IPR policy requires that patent owners provide information on patents and patent applications that they believe might be essential or might become essential to standards such as 3G WCDMA and 4G LTE. ETSI does not police or audit what is submitted to its IPR database. Disclosure requirements might reasonably be increased to include more information on how patent claims map to the standards, but judging this for essentiality or commercial value is not a job for a standards development organisation or the patent office. Antitrust restrictions preclude SDOs from getting involved in valuing patents and setting licensing terms including FRAND royalty charges. 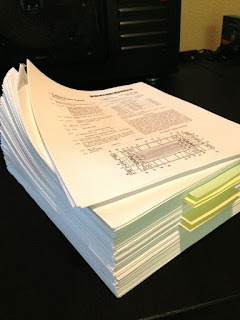 Patent disclosures to SDOs including ETSI were purposely intended to be conservatively-large, including patents which might be or could become essential to standards, but the goalposts are being moved. ETSI’s IPR policy helps ensure that the maximum number of patents will be identified and will be available for licensing under FRAND terms. However, it also tends to result in significant over-disclosure so that patent owners can avoid penalties, such as compulsory, royalty-free licensing if they do not disclose a patent that ends up becoming essential as the patent is prosecuted and as the standard changes in its development. With so much attention on SEP counts and use of these as a proxy for portfolio patent strength and value, some companies seek to maximize the number of patents they declare to justify a relatively high royalty. Inaccuracies, biases in determinations and company disclosure tactics, as above, are why it would be unwise for SEP determinations, SEP counts and any other counts that are used to determine patent and portfolio values to be imposed on the market. · The counting of approved contributions to the standards. Patent counting usefully complements these other SEP evaluation methods in licensing negotiations, but this technique should not be the bureaucratic means of setting prices on a company-by-company basis that would emerge from stipulating patent counting and emphasizing it over other valuation methods. Centrally imposed assessments would likely become increasing dysfunctional and corrupting as the system, its administrators and its operators are gamed or courted for political and commercial gain. Government agencies would do better to keep clear and let licensing parties and third parties in face of market forces decide for themselves which facts, figures and studies they would like to use in licensing deliberations and in litigation. 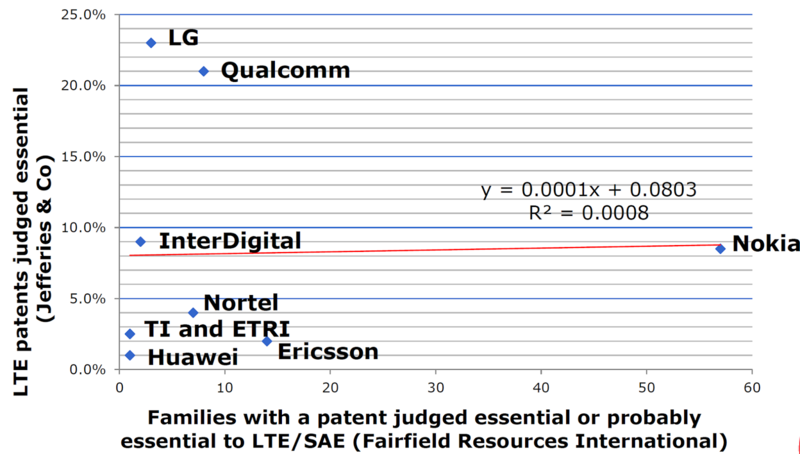 My entire article, here, supports my conclusions by showing methodically how very inconsistent determinations of LTE essentiality and patent strength are among all the different third-party evaluators. It shows that such methods are particularly unreliable in valuing patent portfolios.